Caffeine comes in handy sometimes. 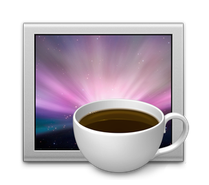 No, not the kind in your cup o’ joe, but the free app for the Mac. If you aren’t familiar with Caffeine, it is an app that enables you to keep your computer awake for a specified length of time. In other words, it prevents your screen from dimming, your screensaver from activating, and/or your computer from going to sleep for a set period of time. When you install Caffeine for Mac, it puts a little coffee cup icon in your menu bar, and you activate it by simply clicking on the cup. You can choose your default length of time, from five minutes to five hours to indefinitely. To turn it off, simply click the coffee cup again. This can come in very handy when you are transferring large files or even when viewing Netflix. Again, Lighthead Software offers this app for free, and it’s available here. I first mentioned Caffeine in a blog post six years ago, and I’ve used it ever since. If you don’t have it, check it out, and I’m sure you’ll find it to be useful, like I do.